2) When the potatoes are finished, drain the water and then cut them into small cubes. 3) Use a frying pan and add in enough olive oil to just cover the surface- not too much. Heat, then add the cubed soft potatoes. 4) Mix around the potatoes and then add cayenne pepper, garlic salt, and black pepper. How much cayenne pepper you want will depend on how spicy you want it. I like it really spicy so I added a lot…. about 1.5~2 tablespoons, 1/2 tablespoon of garlic salt, and however much pepper you want. 5) Cook the potatoes on medium heat until all sides are medium~dark brown. You don’t want them to be still a white~yellow color. 6) In a separate pan heat the tortillas individually by just placing them in a pan, without oil, over low heat for 2~3 mins and turning. 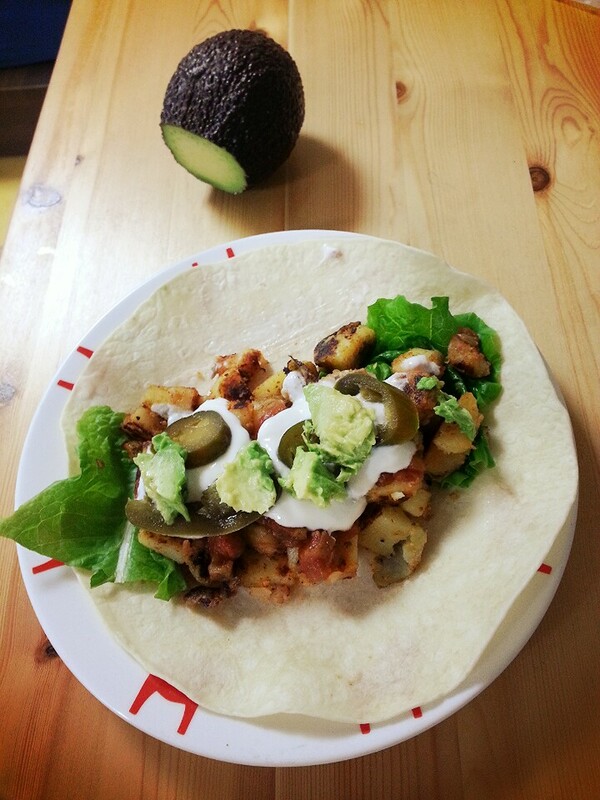 7) Add the potatoes, lettuce, salsa, jalapenos, fresh avocado, and Greek yogurt to the tortilla. 8) Wrap it or leave it open and eat it fork and knife style. This makes about 4 large burritos.